Need bad weather? No prob. We’ll just refinish our pool. 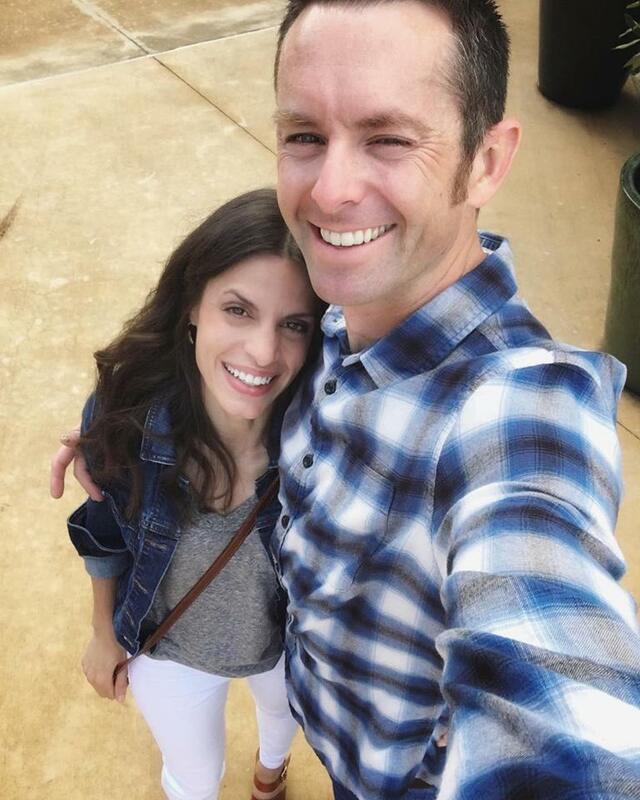 So, anyways, since I have plenty to post about inside the house, but few viable photos at this time, I thought I’d give y’all a little update on what we’ve had going on outside. We knew from the start that our pool would need to be addressed shortly after buying our home. We think it was installed in the late 70s-early 80s and was somewhat neglected for a period of time before the owners whom we purchased the home from lived here. They replaced the filter, drained the pool, and had it cleaned, and while this was much needed (and pretty costly overall: pool filter = not cheap), unfortunately, it wasn’t enough to prevent us from having to put in some bucks as well. The previously white plaster had turned all shades of color as it wore out, which you can see through the water…. And there were cracks in the bottom…. and the coping had settled in towards the pool creating major tripping hazards… We were lucky that the cracks on the bottom of the pool hadn’t yet turned into major leaks. We were told that the process of refinishing the plaster would be much simpler because of this. We would only need a crew to come in and replaster the basin. We were told that if we waited much longer to complete the repairs and the cracks DID worsen into leaks, the process would be much more time consuming and costly. At that point, we would have to get an entirely different crew in there to properly seal the leaks, THEN have a refinishing crew come in to replaster the pool. So, we saved, got estimates, and planned to get it done as soon as we were able. Notice anything missing?? I was at work while the pool was being demoed and that’s when I got the call from Joey. They’d been unable to remove the coping without removing the tile. Apparently, the tile wasn’t in as good a shape as we’d thought. It was barely hanging on for dear life. So, when they went to separate the coping from the tile, the tile came with it. Ugh. Thus, we would have to replace the tile. (= more cashola. Oy.) This is a lesson to remember when you go into projects like this. Always have a contingency fund. You never know when things like this will happen. So, that evening when I got home from work, we chose our tile. 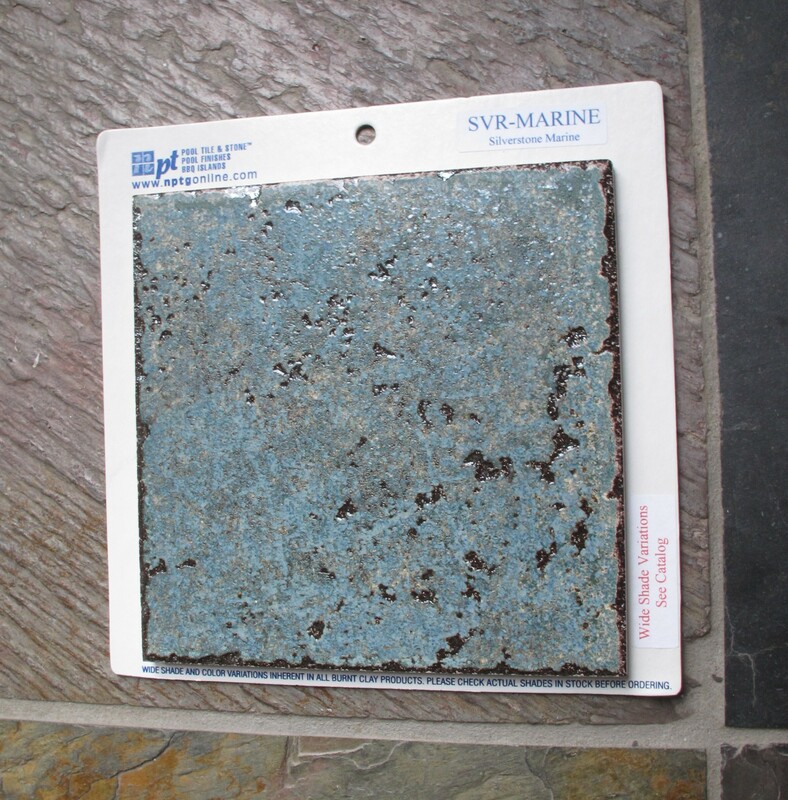 We ended up going with a pretty aquamarine tile with a hint of neutral undertones and a touch of glimmer. The tile (and flagstone) are still really dirty in these pics from the mortar and dust so it isn’t a true representation of their colors, but you sort of get the idea. The little interesting divits and aquamarine shimmers in each tile are covered up by dirt which makes them appear more of a flat green than their actual color. These lovely attributes should be apparent once everything is finished and clean, though. As for our choice, since the original plan had been to keep the green tile (which had white grout), we’d planned on resurfacing the basin with white plaster to match what was originally there. It was too late to change that at this point, so we had to factor in the white plaster when choosing tile. Once water was back in the pool, the bottom would appear blue-ish, so we wanted something fun and bright to compliment that, but still subtle enough to coordinate with the rest of our yard. And this tile accomplished that. Plus, something about that aquamarine tile just spoke to us. It was the first one I was drawn to. Two days later another crew came to prep the basin for plaster. They chipped away any weak spots in the current plaster and applied a grey coating which we assume is some sort of primer/sealer (don’t quote me, though)…..
Then, Murphy’s Law happened. We went from sunny weather in the 50s-60s to weather in the 20s. In a day. In ONE day. #mothernaturesoncrackagain At this point, it was 7 days after they’d drained the pool. And we had an ice storm…. Two days later the 20ish-degree weather turned to 50ish-degrees…. and it rained. 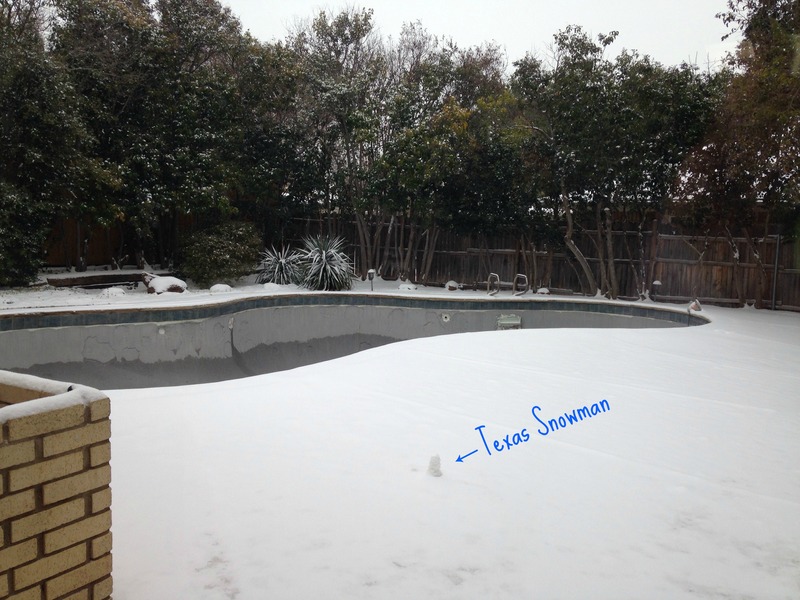 Then, the temperature dropped again into the 20s by that Friday and we had a bonafide Texas snow storm…. I know most northerners are probably laughing at this meager amount of snow, but here in Texas it qualifies as a big deal (sadly). The roads get slick and since we don’t have this weather often, nobody has snow tires… or knows how to drive for that matter. Seriously. 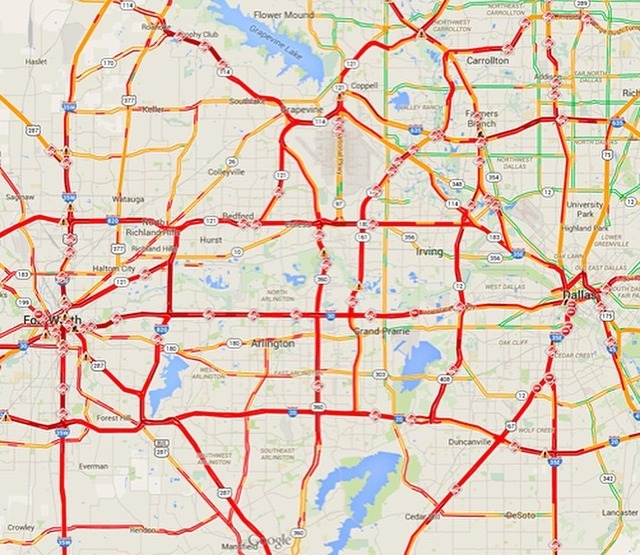 The traffic map that Friday looked like this…. Most major highways… RED. (Insert pointer-finger-gesture) REDROAD! REDROAD! I was driving to work that Friday morning as the snowstorm was just starting to get bad and I witnessed two wrecks happen in front of me and three different cars spin out across the lanes and into the shoulder (as I was also slipping and sliding on the road although I was driving slowly and cautiously). It was stressful. I got to work, hurried so I could head home ASAP, and then got back on the roads. Ugh. My drive home (which normally takes 20 minutes) took an hour and a half. It was bumper to bumper traffic. But, at least I got home safely (and with a newly refreshed craving for wine in very a large glass). So, anyways, That’s where we are right now on the pool front. It’s two weeks post pool-draining. It’s 39 degrees. It’s rainy. And snow is in the forecast for Wednesday. OH! But, WAIT. It’s supposed to be 66 degrees tomorrow. Riddle me that.